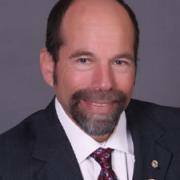 Our speaker this week will be District Governor Kevin Eisenberg. Please plan on attending the entire meeting on August 6th. There will be no early leaving. President Mark Burchill rang the bell and Matt Everson failed to answer the call, leading us in the Pledge of Allegiance from an undisclosed location. 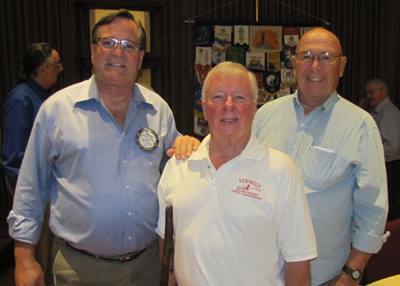 Fred Levin then led us in a moving invocation..
Steve Marburger handled the Visiting Rotarian duties and several visitors graced our club today. Of the visiting Rotarian variety, were newspaper publisher Rollie Atkinson from Sebastopol. Leah Hanson also visited from Sebastopol. From Windsor, we had Art Dilz and from Dominguez Hills, Glen Mitchell. Mykhael Wilson, a Rotary member in waiting, guest of Mark Burchill. Steven Dunn, from Boy Scouts of America, also a prospective member. Robby Fouts skillfully presided over the raffle today, which Mark described as a “Battle of the Sexes”! Two numbers were drawn. Gesine Franchetti was the first number called and then Robby drew……..his own ticket number! Both contestants were asked to answer questions and Robby surprised everyone by knowing that “knit one, pearl one” are Knitting terms. (word is that he is crocheting on a shawl in his spare time). Not so sunny today. Penny Tibbetts reported that former prominent member & Past President Bob Burpee’s wife McKenzie recently passed away. Kathleen Archer reported the sad news that another past dear member, Judith Hall, passed away on Tuesday, August 5th. Funeral arrangements are pending. What region of the world has been declared polio-free by the World Health Organization? 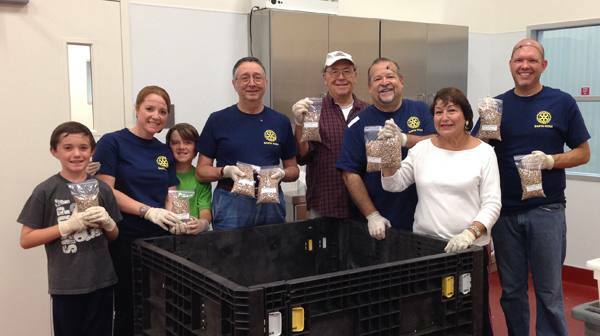 6 Rotarians and 2 future Rotarians packed about 1,000 pounds of Pinto Beans on Saturday morning at the Redwood Empire Food Bank. Pictured are Anthony, Carmen, and Joey Sinigiani, Mark Burchill, Rich deLambert, Jose Guillen, Jane Duggan, and Mike Kallhoff. 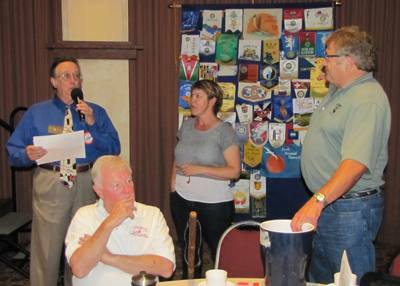 President Mark shared some board actions taken at the most recent Rotary Club of Santa Rosa board meeting. Mark took a few minutes to explain our attendance policies, which vary from club to club. Wayne Rowlands announced that he will be hosting a barbecue rib social at his lovely home for the Rotary Means Business meeting on Thursday, August 7th. Sounds like fun! Don McMillan is organizing volunteers for the World Pillow Fighting Championships to be held next month at Sonoma Mountain Village. For those who will be volunteering at the beverage sales area, a two hour training course is required. Really? You need training to pour beer? Yale Abrams saluted those members who volunteered last week at the Redwood Empire Food Bank. Eileen Carlisle generously donated a 4 night stay at the Hyatt in Breckenridge, CO to raise money for the John Brown Scholarship Fund. Layne Bowen purchased the 4 night stay for $300. HE GIVETH, HE TAKETH AWAY……. President Mark presented those brave souls who participated in last week’s first ever Rotapalooza Talent Show with Rotary Bucks to be used at a later date. He then extracted $2 from every club member who was not wearing a Rotary pin, shirt or decal at today’s meeting. Richard Gulson presented today’s program, which featured two components. The first component, focused on Richard’s experience with contracting polio as a nine year old in 1952 post-war England. The second component featured his history as an original organizer and the history of the Kenwood World Pillow Fighting Championships. Richard explained that he spent over 6 months in an “isolation hospital” when he was first diagnosed. He shared his recovery experiences of wearing leg braces and being given physical therapy for two years. He also said that he suffered from what is now called Stockholm Syndrome upon his return home from the isolation hospital. After having contracted polio, Richard was given his first vaccination in 1955. In 1957 he had to have orthopedic surgery. Richard described that the polio virus is an enteric virus and noted that poor people with poor sanitation are the most likely to contract polio .The virus kills or damages muscle cells and in more severe cases kills cells in the spinal column. Recovery is sometimes complete, but often is only partial. Many polio survivors experience onset of Post Polio Syndrome later in life which can cause pain, muscle fatigue and loss of muscle mass. Switching gears, Richard then gave us some history on the Kenwood Volunteer Fire Department (KVFD)World Pillow Fighting Championships. Starting as a “Tug of War” in 1967 as a way to raise some money for expensive fire-fighting gear for the KVFD, the event took over the pillow fighting championship from SF Boat Show owner Tom Rooney. Between 1967 and 2006 the fights exploded in popularity and growth. Notable names associated with the pillow fights include: King Neptune, Fire Fighting Chief Ed Geib, TV personality Merv Griffin (who twice televised the event) Kenwood resident and comedian Tommy Smothers and the mysterious Father Guido Sarducci. Notable announcers CBS’s Jim Meyers and Pat Kerrigan were also mentioned. Before you know where you’re going, it’s good to know where you’ve been, right? It was great for our club to gain a little historical perspective on this fundraising event in which our club will be involved. I’m Helping! Are You! Everyone’s help is needed! See Don McMillan for assignments. He is the volunteer coordinator.